Carpal tunnel syndrome examination. 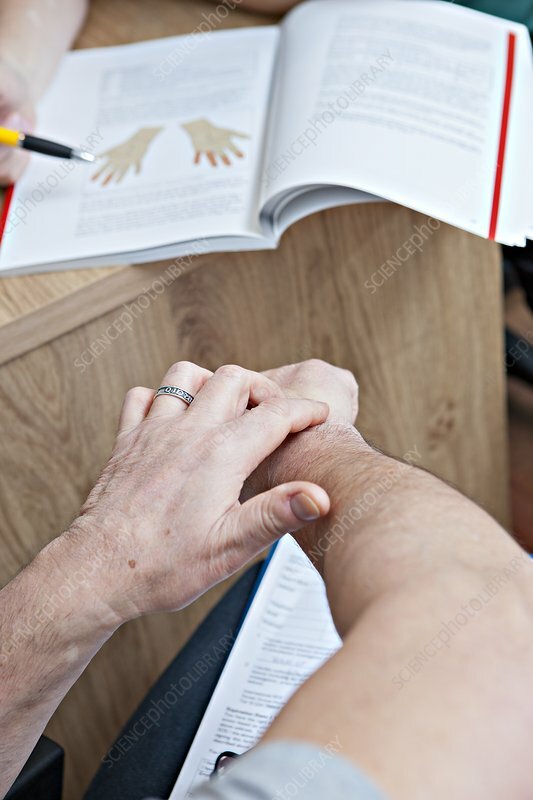 Patient describing symptoms of wrist pain due to carpal tunnel syndrome (CTS) during a consultation at a general practice (GP) clinic. The medical practitioner is consulting information on the condition in a medical textbook. Carpal tunnel syndrome is caused by the median nerve from the arm being trapped by bones and ligaments in the wrist. It can cause pain and numbness in the fingers, and can affect hand and wrist function. In severe cases, the ligament trapping the nerve may be surgically cut to treat the condition. Photographed in Edinburgh, Scotland.